The technical committee on mechatronics formed by the International Federation for the Theory of Machines and Mechanisms, in Prague, Czech Republic, adopted the following definition for the term: Mechatronics is the synergistic combination of precision mechanical engineering, electronic control and systems thinking in the design products and manufacturing process.Due to developments in powerful computers, including microprocessors and Application Specific Integrated Circuits (ASICS), computational techniques, diverse technologies, advances in the design process of products and other factors, the field of mechatronics has evolved as a highly powerful and most cost effective means for product realization. 1. Mechatronic Systems Techniques in the Implementation of Nonlinear Controllers of Synchronour Generators 2. Mechatronic Techniques in Boiler Turbine Generator Control 3. Neural Networks for Pattern Recognition & Data Classification 4. 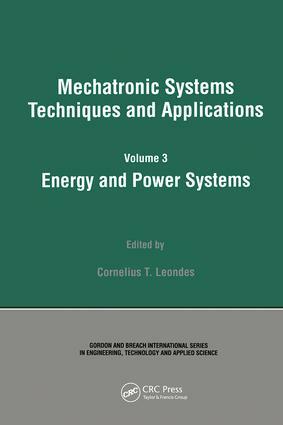 Mechatronic Techniques in Intelligent Heating, Ventilation and Air Conditioning Systems 5. Nonlinear Contra of Gas Fired Engine 6. Mechatronic Systems Techniques in Teleoperated Control of Heavy-Duty Hydraulic Machines.